Detroit-based industrial designer Jack Craig crafted a curious table and stool that are all about the process. 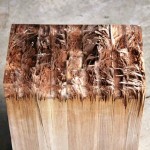 Made from smashed and reconstituted pinewood, the Broken Board Series 2 is sealed with caramelized resin. 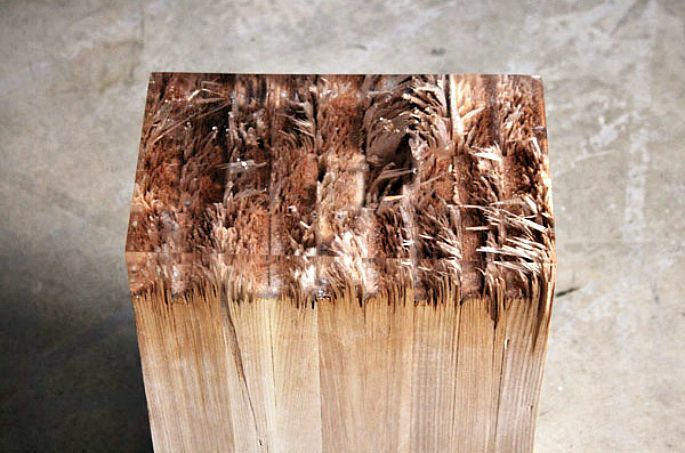 Its clear honey-hued top leaves the broken wooden ends exposed while creating some surprising visual effects when objects are placed on it. Jack Craig has an interesting background. He was first trained as an engineer at the University of Maryland, and later he worked for the US Navy in the infrared division before leaving to pursue a degree in Industrial Design at the University of Illinois. Nowadays he’s based in Detroit, having earned a Masters of Fine Art in 3D Design from the Cranbrook Academy of Art. 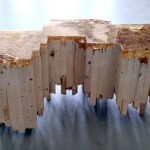 His unique and very interesting pieces are based on materiality and the shaping processes. 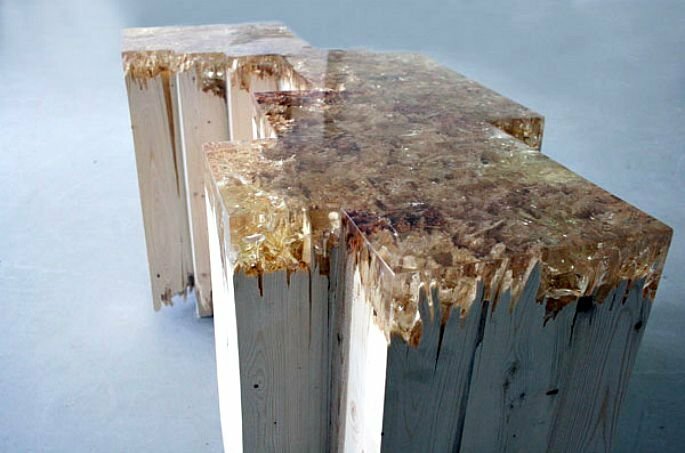 He’s worked with PVC, bronze, wood, fiberglass and resin, creating unusually shaped furniture that is both intriguing and process-based. 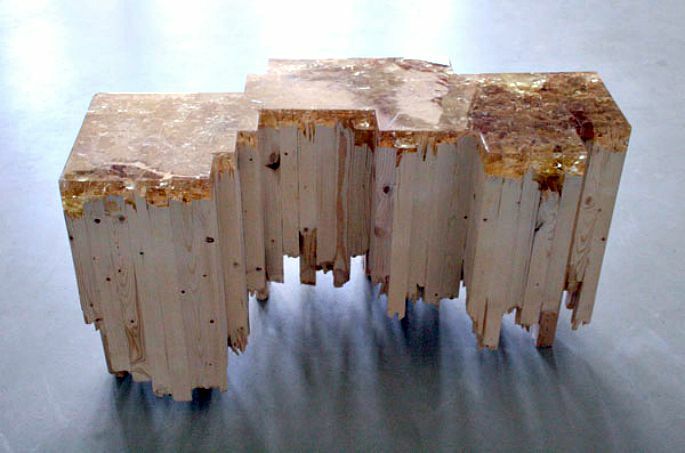 This experimental approach is quite apparent in his Broken Board Series 2 table and stool, crafted with pine planks from a hardware store that look as if they were roughly chopped by hand. 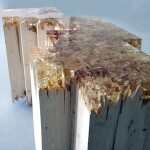 The splintered ends (still present on the base) add an interesting edge to the chunky fractured design. On the top, they’re still visible, but are blunt thanks to a “repair” through polyester resin. 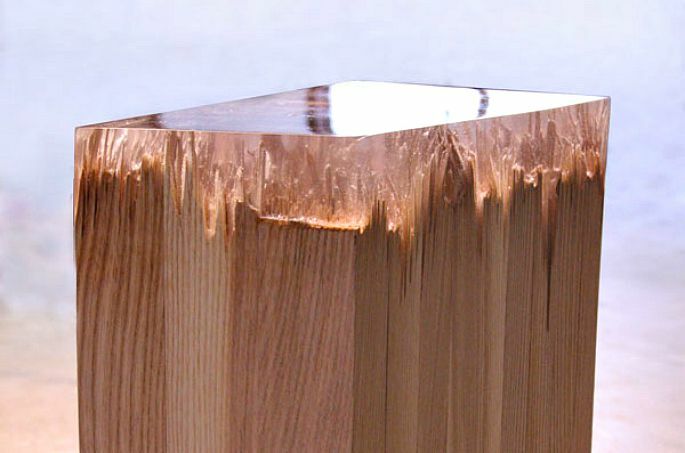 This caramel-like translucent material affords a sweet table or seat top that makes human force visible, but is still functional and very unique. 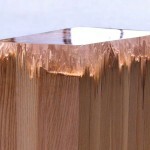 See more interesting furniture pieces by Jack Craig here.